This article focuses on the use of CMidiMusic which allows an easy access to DirectX DirectMusic API. This class allows loading and playing general midi sequence files(.mid). The class is designed to perform midi playback in one segment and offers additional features like using any midi port installed in your system, 3D sound environment, sound effects, etc. The last version of Direct Audio allows using hardware acceleration for sound synthesis. With the new AudioPath model, the sound of a port does not go directly to a directsound buffer, instead, it goes to an audiopath which controls data flow from a performance to the final output. The audiopath allows controlling the 3D position of each sound and adding other effects. The segments are modified independently and you can apply effects like pan, volume, individually. It allows using DLS2 (Downloadable sound level 2 standard) which provides a great sound quality and unlimited use of instruments with the software synthesizer. FX (Reverb, Chorus...) if it is available in the software synthesizer. It overcomes the 16 midi channels limit, allowing the use of as many midi channels as the software is able to handle. The playback can be controlled accurately in run time by selecting different sets of musical variations and changes in the chords progress. IDirectMusic8: This interface allows managing buffers and ports. There should only exist one instance of this interface per application. IDirectMusicPerformance8: This is the most important interface in playback management. It is used to add and remove ports, play segments, notify event reception, control music parameters and obtain timing information. 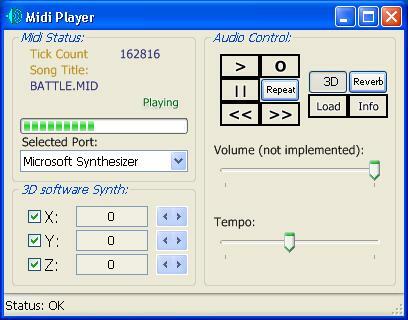 IDirectMusicPort8: This interface provides access to DirectMusicPorts objects like MPU-401 or the software synthesizer. IDirectMusicSegment8: This interface represents a segment, musical piece made up of multiple tracks. It can contain a midi file, a wave, a segment. IDirectMusicLoader8: Its main function is to find and load the different objects. These objects are to be stored in a segment. IDirectMusicSegmentState8: The (playback) engine creates a SegmentState object which allows analyzing the state of the segment currently playing. IDirectMusicAudioPath8: The IDirectMusicAudioPath8 interface represents the stages of data flow from the data file to the primary buffer. Once a resource has been loaded in a segment, the performance dispatches the messages defined by a tool of an application, such tools are grouped in toolgraphs which process specific segment messages. A tool can modify a message and pass it on, delete it, or send a new message. Finally, the messages are delivered to the output tool, which converts the data to MIDI format before passing it to the synthesizer. Channel-specific MIDI messages are directed to the appropriate channel group on the synthesizer. The synthesizer creates sound waves and streams them to a device called a sink, which manages the distribution of data through buses to DirectSound buffers. Sink-in buffers are DirectSound secondary buffers into which the sink streams data. Here are applied many effects like 3D, pan, volume, etc...The resulting waveform is passed either directly to the primary buffer or to one or more mix-in buffers. Mix-in buffers receive data from other buffers, apply effects, and mix the resulting wave forms. These buffers can be used to apply global effects. The primary buffer performs the final mixing on all data and passes it to the rendering device. In first sight, it is necessary to add in Visual C++ IDE this library: Go to Project -> Settings -> Object Library Modules and add dxguid.lib of DirectX8 SDK. For more information about the CMidiMusic class, read the attached file readme.txt included in the sources. You will be able to find more information in the online help of http://www.microsoft.com/directx and DirectX 8 SDK technical documentation. As you can see, this is not WinAmp, wish it was. ;) Nevertheless, all of CMidiMusic class features are made available. May I convert and redistribute your project? I'm starting to convert your project from MFC to SmartWin++. as an example project or if there are some restrictions. my "Reverb" button does not seem to work on my system (maybe it's just a question of "Synthetizer"). Re: May I convert and redistribute your project? Of course, you are completely allowed to include it (I'm aware you are refering to CMidiMusic class) in your IDE related project, even the DirectMIDI library . You don't have to pay anything in return, however, some acreditation in your project would be grateful (I don't eat air ). Good luck with your great project! Maybe someday I make use of it. Who knows! i just read the cMidiDemo article and needed something with more "performance" features so i decided to read this stuff about directx. i'm a newb so i dont really need much info on performance at the moment. but what i do need is some sort of strp by step guide on how to set these projects up in msvc++ and run them. basicaly i need lots of help on starting up apps so i can get comfortable with an IDE. can someone please help? any links to midi related tutorials with such features? Thank you for appreciating this old piece of code. Thank you for your reply. I just find a little bug in your program and i need your help again. When use pause button some note was skipped. Could you plese help me to fix this problem. I found that note skipped is relative with tempo. the CMidiMusic class is great. I have written a simple Midi file editor using CMidiMusic to playback a Midi file. When the Midi file gets changed and the user wants to listen to the changes, I tried loadind the Midi file again. This didn't work because DirectMusic seems to have a lock on the old Midi file. When I destroy my instance of CMidiMusic and create a new instance it works fine. Since I neither know the internals of CMidiMusic nor the internals of DirectX. I wanted to know if this is a safe way to use CMidiMusic. Of course. There is not any other alternative at this abstraction level because the IDirectMusicLoader8::LoadObjectFromFile locks the file completely and doesn't allow any other shared access to the resource. Therefore, your solution could be valid at object oriented level, though it would be better to use the audio part of the DirectMidi library to get it, since it allows to migrate from the CDirectMusic object level to a more accuracy DirectX/DirectMusic API level using CSegments wrapped objects. Unfortunately, in DirectMusic is hard to access to the IDirectMusicSegment internals in order to modify MIDI commands and music data, otherwise, your problem could be solved in a smart way. You could also work with allocated memory, making all the modifications in a memory space dedicated to store modified MIDI data and, finally, saving it to disk. This approach could be, more or less, -use files only when needed-, not like an intuitive operation. I'm using MCI to playback MIDI for a game. Having all my music parts in the same midi file has worked great till Win XP, where suddenly MCI_OPEN delays proportional to the file size, in my case 20 seconds to load. Resorting to DirectMusic to solve the problem but would do fine with the low level API found in WINMM.DLL which works perfectly without any delays. But here's the problem. When setting a start position the music doesn't start where it should. Having checked the exact time position in a several midi editors, setting the start pos doesn't work, even if adjusting the position +- a few seconds. This worked fine in earlier versions of MCI, Win 95/98. I'm also a little confused about your questioned problem. You said you are using MCI for playing MIDI music for a game. Then you said that the MCI_OPEN command suddenly delays the amazing amount of 20 seconds to load the MIDI sequence. Why is that? Are you using DirectMusic via DirectMIDI? otherwise, which interface method are you invoking? Please, I request you to be as explicit as possible when descibing the problem. Thank you. Thank for the quick reply. I'm currently testing the other option as he descibes MMSYSTEM, midiOutxxx() and midiStreamxxx() and it runs perfectly except for the problem setting the correct start position. For example, I have several music parts in the midi file and the second part start at say, 3.38.000. When playing the file from the beginning all parts start where they should. If setting the start position directly to 3.38.000 nothing happens. If I set the start pos to 3.30.000 and play from there it's quiet at 3.38.000 and after. Even stranger, some other music part in the file plays correctly when setting their start pos. I've tried both with midi format 0 and 1. It's a very strange problem. I don't know very much about MMSYSTEM midi commands so I can't be very helpful for you. Nevertheless, I suggest you to use the CMidiMusic class to discard any problem in the MIDI file or the program logic. Use the HRESULT CMIDIMusic::Seek(MUSIC_TIME mtMusicTime)method to check it. It should work fine. The standard MIDI file specification has provision for multiple ports to overcome the 16 channel limitation of a single port. I have several MIDI files that are encoded for multiport use, but they can only be played from within a MIDI seqeuncer that supports multiple ports. I would very much like to write a MIDI file player that supports multiport MIDI files, however, DirectMusic loads the entire MIDI file into a single segment and does not allow one the opportunity to modify which track goes to which port. Am I missing something? How would you go about implimenting this scenario? The solution is not easy in any case. First off, DirectMusic architecture doesn't support multiple ports in an "easy to code" way because it hasn't got any track information related to device or ports. The first one is to develop a MIDI file reader and parser that extracts the ports assigned to MIDI channels and then, programming the player from the scratch using multiple directmidi::COutputPort objects. The second alternative is also to develop a MIDI file reader and parser and then using directmidi::CPortPerformance::AssignPChannel to route a specific performance channel to another port. In this approach, you must manually download the instrument from the MIDI file to the performance channel in order to play in a different non-default port. I am familiar with parsing MIDI files and I am familiar with port handling in DirectMusic, it's getting MIDI messages into segments programmatically that has me stumped. does someone know how to retrieve the length of a midi-file in seconds or milliseconds? for some midi-files it's totalticks/768, for others it's totalticks/768/x, where x is some obscure factor. GetGlobalParam(GUID_PerfMasterTempo,... doesn't work because it's not that x (despite the fact, that you have to call SetGlobalParam() once to be able to user GetGlobalParam()). I've found the following VB Code elsewhere on the Net, but I can't find similar Functions in the C++ Interfaces of my DirectMusic Documentation. Is it possible to translate that into C++? 'number of seconds the file lasts. Those formulas are right. If you analyze the last one, you can take notice that seg.GetLength() is the number of ticks your segment lasts, understanding that the ticks are incremented DMUS_PPQ times for each quarter-note where DMUS_PPQ is defined as 768 ticks/(1 beat = 1 quarter note). Therefore, if your MIDI sequence returns 301558 ticks in the count, for example, you'll have 301558/768 = 392.65 quarter notes in your sequence. Then, you will have to obtain the tempo of your sequence (remember that your sequence can have several tempo changes). If you observe the tempo changes in a sequencer, you can obtain the total time in minutes if you divide the number of quarter notes by the BPM's or beats per minute. Therefore, if you have 392.65 beats in your MIDI and 98 BPM, the total minutes will be 392.65/98 = 4 minutes x 60 = 240 seconds. If you decide to apply this formula you will have to obtain the tempo in each MUSIC_TIME (ticks) of yor sequence. To perform it in C++, you will have to retrieve the GUID_TempoParam parameter using either IDirectMusicSegment8::GetParam or IDirectMusicPerformance8::GetParam and providing the current MUSIC_TIME of your sequence to achieve it. Personally, I've never tried to call GetParam thousands of times to get tempo changes, it would be a madness, besides it's against the system performance. If I were you, I would read part of the MIDI file to obtain the tempo track and finally read the tempo marks inside it to use them for your time seeking calculation. Hi thanks for your response. How do I go about finding which track is the tempo track? And once I find the tempo track, aren't I going to have to call GetParam and pass the track # in? Even without knowing which track is the tempo track, if I am calling GetParam to get the tempo, and pass in DMUS_SEG_ANYTRACK, isn't it going to apply to the tempo track anyway? In other words, is it going to save me any trouble to know which track is the tempo track? Won't I still have to read through it using GetParam? Try to read part of the MIDI file as I told you and extract the tempo chunks from it. Your tutorial is excellent and thanks for a convenient class to play MIDI. I'm trying to make a player that can show up the lyrics of the MIDI (if it has). How can I extract the lyrics and the time-stamp of each word to show up on screen correctly corresponding to the note like Vanbasco Player? The solution is not very simple with DirectMusic. I suggest you to program a DirectMusic Tool using the IDirectMusicTool8 interface and the IDirectMusicTool8::GetMediaTypes method with the DMUS_PMSGT_LYRIC capture parameter in the call. Then, you must also modify the sample code "DirectMusic\MusicTool" that comes with the DirectX SDK and explains how to handle this feature. The other alternative is to make a simple MIDI file reader that handles with the lyric event track. Thank for your quick reply, it seems more complicated than i thought I have one more question for your advice, if i have already got the time-stamp and word of each meta lyric event (possibly store in a array) then is this possible to synchronize the word using Window timer if i know the bpm (beat per minute) of the midi file?